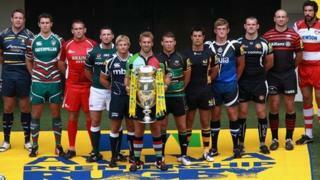 Premiership Rugby has signed a four-year broadcasting deal with telecoms firm BT worth £152m. From the 2013-14 season, BT will have exclusive live broadcast rights to Aviva Premiership Rugby and the JP Morgan Asset Management Sevens. From 2014-15 it will also have the exclusive rights to matches played by Premiership clubs in any future European competitions, for three years. It comes after BT also secured live Premier League football rights. In June it was announced that BT had secured the rights to broadcast live Premier League games for the first time, securing the rights to 38 matches a season from 2013-14 to 2015-16. Live Aviva Premiership matches are currently split between BSkyB and ESPN, and under the new agreement, BT will have live broadcast rights to up to 69 matches a season. "This is a game-changing agreement and will deliver a service that I know our club supporters will enjoy," said Mark McCafferty, chief executive of Premiership Rugby, the umbrella body representing the Premiership Rugby clubs. As well as showing the live games, BT will assist clubs in upgrading the technical infrastructure at their stadia. The deal covers a time period which will see the Rugby World Cup staged in England in 2015, as well as rugby sevens being played at the 2016 Olympics in Rio.